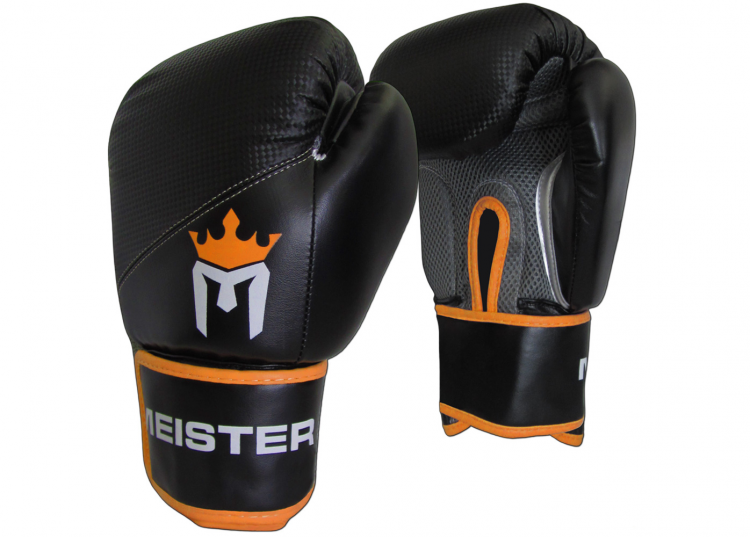 The Meister Pro Boxing Gloves are designed to be an all-purpose pair of gloves. This means that they can handle the impact from long heavy bag sessions as well as be appropriate for sparring. Meister has made these gloves available in three different size options: 12, 14 and 16 ounces. Upon reading the following review, you will find that these gloves are a great option for beginner and intermediate level boxers. Appearance: The Meister gloves have a few features that give it a unique appearance while not being too flashy. Besides the company name on the wrist straps and the logo on the back of the gloves, Meister also added a carbon fiber texture design along the back of the knuckles and fingers area. Overall, I find these components provide a clean and tasteful design. Padding: Upon setting my eyes on the gloves for the first time, I noticed that the shape of its padding seems quite boxy The image below shows how the shape of the Meister padding compares to the Reevo RXR boxing gloves. 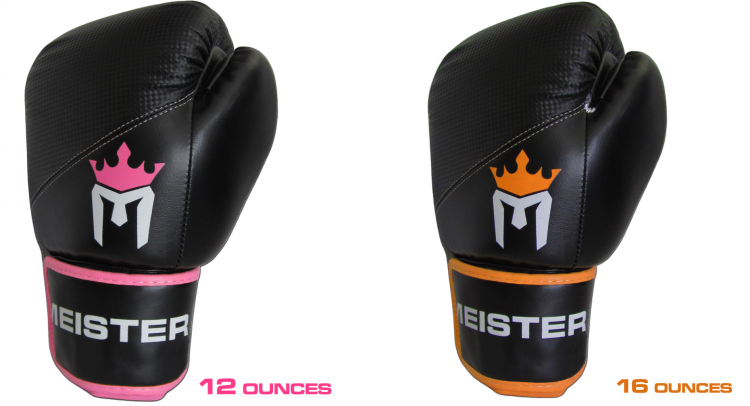 Color Options: One downside of the Meister boxing gloves is that it is only available in two color schemes. The 14 and 16 ounce gloves have the orange trim while the 12 ounce gloves’ trims are pink. Breathable Palm: The underside of the gloves consists of a mesh material that runs from the wrist section to all the way down to the fingertips. Furthermore, there is a gap running along the middle of the glove as well. Both features makes the gloves more breathable and speeds up the drying process. Although the Meister gloves incorporate the mesh design for breathability, you still have to take the time to clean and dry them out properly. Otherwise, the sweat may not fully dry out and the gloves will start emitting odor over time. The image below display this breathable palm design as well as the interior lining. Palm Midsection: These gloves have no elastic bands. The following image compares the Reevo RXR and how it has two elastic bands to keep it tightly shut. Wrist Straps: While the wrist straps are wide and does not completely loop around the gloves, it stills provides a secure fit, especially if you have handwraps on. The Velcro feature allows its users to easily put the gloves on and take it off by themselves. Of course, it does not provide a secure fit as gloves with laces. Thumb: The top of the thumb piece is connected to the glove via a long and thin strip of synthetic leather as shown below. Grip Bar: A standard bar running horizontally along the glove is great for gripping onto while you throw a punch. Stitching: The Meister gloves integrate a unique stitching design on the back of the hand unlike many other boxing gloves. I am not sure if there is any benefit to this design, but the stitching has held up well so far. Wrist Straps: Everything related to the wrist straps is looking good and has shown no significant signs of wear and tear. Furthermore, the Velcro portion is maintaining its stickiness fine. Exterior Material: Even though Meister is made with synthetic leather, it has proven to be durable. The carbon fiber texture has not worn out yet either. Logo: The screen printed logo and company name has so far withstood the test of time. However, its long term durability is still questionable. The logo is also conveniently placed where possible damages to it is kept to a minimum. 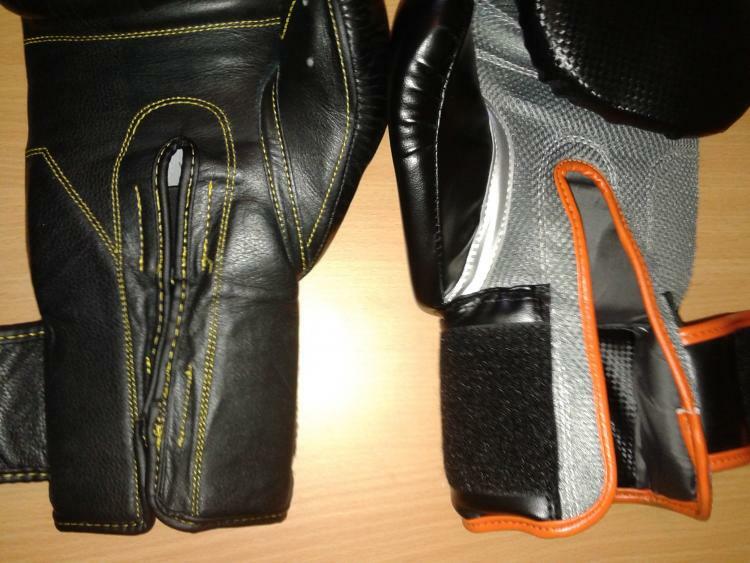 The Meister gloves are completely fine to use without handwraps. The grip bar grants me the ability to comfortably punch while maintaining a secure hold on it. When I do wear cloth handwraps under these gloves, there is still room for it and gives it an overall snug fit. I enjoy the fit a lot better with the handwraps. I have only use cloth handwraps with these gloves and have not tested them with gel handwraps. Thumb: The thumb portion is quite wide and does not curve as much as other boxing gloves I have worn. I am not a fan of it and it does not feel as natural to form a fist as my previous boxing gloves. 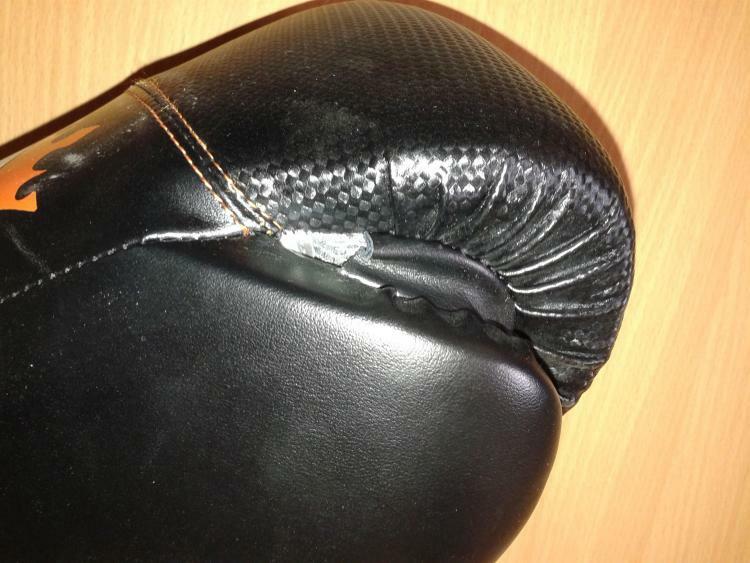 Breaking in the Padding: Due to the rigid nature of the padding and its boxy feature as previously mentioned, you will have to hit the heavy bag for a bit to break down this padding and make the Meister gloves feel more comfortable to use. Padding Size: I am not a huge fan of the padding’s width, especially for my hand size. Even though I can still use the glove fine, I do not like the extra roominess. However, the one benefit of the wide padding is the extra defensive benefit it provides during sparring sessions. The Meister gloves allows you to hide behind it well because their extra wide paddings eat up the gaps for incoming punches to enter through. Those with large or wide hands should give the Meister gloves a shot, since they run relatively wide compared to most gloves. On the other hand, these gloves may not be ideal for youth boxers. The 16 ounce gloves might also be too large for women boxers as well, therefore it is recommended that they choose the 12 or 14 ounce option. Padding: The Meister gloves have two separate section of padding for protecting the back of your hand. The main padding is composed of high density foam. The portion of the gloves where the carbon fiber design exist has an additional soft padding between your hands and this dense padding. I find the dual layer of foam padding by the knuckles gives me plenty of protection for throwing hooks to the heavy bag comfortably. Sparring: Although these gloves are supposed to be used for hitting pads and sparring, the foam padding may be great for its user but not ideal for their training partner. 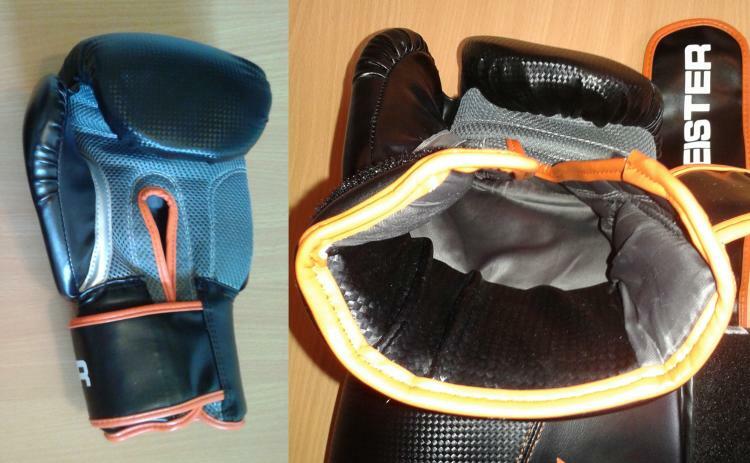 The padding is thinner and harder than typical sparring gloves. Therefore, you should consider using them more for light and technical sparring. Wrist Padding: The wrist padding covers the back of your wrist and its sides. The padding on the sides consist of thin foam paddings while the padding on the back of the wrist is composed of a hard density foam padding for extra protection. The latter cushion is fantastic for absorbing strikes on the wrist. Therefore, it is ideal for kickboxing and Muay Thai training as well. Wrist Support: The stitching along the wrist section of the Meister gloves cause it to be fairly flexible. The Meister gloves are resistant to flexing backwards, but it bends forward quite easily. Without using handwraps, these gloves may provide a higher risk of spraining the user’s wrists. However, this flexibility is actually preferred by a Muay Thai practitioner because it allows you to maneuver it effortlessly for clinching, especially for obtaining the plum grip. 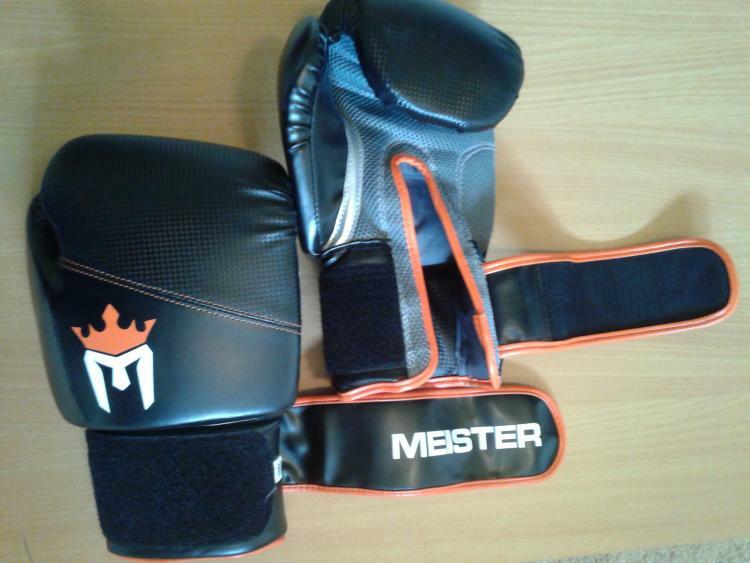 The Meister Pro Boxing Gloves are very budget friendly and should be an option for consideration by individuals interested in joining a boxing club in the nearby future. In addition to that, these gloves typically come with a convenient carrying case with mesh sidings for air circulation, which is excellent for drying out the gloves after class as you are heading home.